Located on the edge of the very hip Hayes Valley, and in the center of San Francisco's Cultural District. The apartment is three blocks from the San Francisco Opera, Symphony, the San Francisco Jazz Center and Asian Art Museum. This luxury one bedroom, one bath penthouse apartment with incredible views of the City, is located in a luxury complex with many amenities. The apartment is well-appointed both in furnishings and artwork. In addition, guests may use the heated pool and jacuzzi located in the courtyard below, work out in the well equipped gynnasium and play racketball on one of two courts. Secure parking is included. 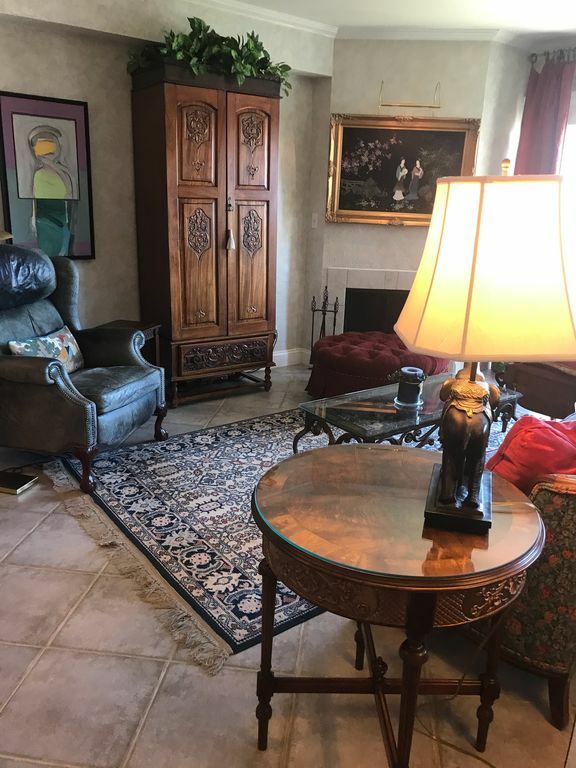 We live in lake Tahoe and have this apartment for our 'City Fix' We enjoy all the cultural attractions, wonderful walks, specialty restaurants and special events. It's location is wonderful. The amenities the Opera Plaza property offers is quite exceptional for San Francisco. It is a very secure and well managed building. We are always thrilled to stay in our apartment. The views are spectacular, especially at night. Recently remodeled. Shower over tub. Equipped with safety handrails. Fort Mason at the end of Franklin St is another walking area with views to Alcatraz and a beautiful walk which could take you all the way to Fisherman's Wharf o the Golden Gate Bridge. Lands End, at the end of Geary Street offers beautiful views, a museum and a walk overlooking the Golden Gate Strait and the Pacific Ocean. Unforgetable views! Beautifully furnished with flat screen TV. Magnificent views of City Hall which is exceptional at night. A well appointed kitchen. State of the Arts appliances. Everything one needs to prepare morning coffee or a lovely dinner. Book store is located on premises. Views overlooking the City. Nice for morning coffee. Overlooks city and pool area. Outdoor heated pool with poolside lounge chairs. This is an incredible addition to City Living! Our apartment is convenient to the center of San Francisco's cultural district including The Opera, Symphony, Herbst Theater, San Francisco Jazz Club, the Asian Art Museum, the San Francisco Public Library, the Orpheum and Golden Gate Theaters. Hayes Street with many colorful shops and trendy restaurants are located three blocks away. We are convenient to all public transportation. Downstairs and within the public portion of our building is Peets Coffeehouse, Max's Deli, a Japanese Restaurant and the Opera Plaza Independent Movie Theater and a well stocked book store. An AMC movie theater showing all the recent movie offerings is three blocks up Van Ness Avenue. I booked this unit for my parents. Shirley made sure that everything was perfect for their stay. The building amenities are hard to match in this area. The unit itself is clean, well decorated and has a great view due to the top floor location. Thanks for everything. From the moment Shirley required an interview before approving my stay, I sensed this property would be special, and indeed it was. Very clean, nicely appointed unit, all the day-to-day items anticipated, convenient laundry (same floor), extra levels of building security, efficient and secure Wi-Fi, great location for using Muni (city transportation). And then all the extra building amenities including a secured parking space for your car! The southern views from the condo are exceptional; you can not only see the City Hall dome from the balcony, but also in the living room mirror, as well as from your bed. I couldn't have been happier and highly recommend this unit. Perfect place to enjoy all of San Francisco! My husband and I spent a month in this lovely penthouse. The owner, Shirley, was great to work with. Very helpful and gave us lots of tips! Housekeeper was also a lovely person. This apartment is in a quiet part of the building on the top floor. The views are amazing from here! The underground parking was a HUGE plus for us because parking on SF streets can be a nightmare. The pool and hot tub were a real bonus plus the workout room had everything we needed. Security was always at the highest level so it is very safe here. There are hundreds of great shops and restaurants within a 10 minute walk from here. The condo was very clean, bed very comfortable, towels & robes soft and plush, and kitchen well-stocked with supplies and tools. I would 100% recommend this place to anyone looking to stay fairly central in SF in a very safe and secure building. I stayed here for a month. 1 week with my husband and 3 weeks by myself. This apartment is centrally located. Every facility you need is here - private parking, laundry in the cleaning lady, bldg, patio, exercise room with outdoor pool and tub. She is always available to answer any questions on the phone and I would recomemmend this to everyone. Will definitely stay here again. Thank you so much!!! The apartment is ideally located to take full advantage of San Francisco such as Hayes Valley, the Haight, the Marina, Pacific Heights, Japan Town, Civic Center and the Ferry Building. With few exceptions most destinations are walkable but also by bus. It comes with a parking space which makes it more convenient. Shirley is like an Aunt who has thoughtfully prepared for a relative's visit. The apartment has every detail accounted for from band aids, racket ball equipment and robes for the jacuzzi. Yes it has a full health club and outdoor heated swimming pool. It is like a five star hotel on steroids. I would have stayed there longer but alas it is fully booked through December 2014. The description on VRBO is accurate. All of the amenities one needs for a comfortable stay in San Francisco. A dedicated parking space in the underground parking garage is a real plus. The owner is very pleasant to deal with. We had a wonderful month in the city and hope to return. Our PENTHOUSE apartment is located on the 11th floor. It is south facing which allow nice sunlight in throughout the day. We have exceptional views towards the Opera House and City Hall which, when lit at night, is especially beautiful. We have many activities within the property. An outdoor swimming pool, Jacuzzi, sauna, 2 racquetball courts, a well equipped fitness center, Opera Plaza Movie Theater offers independent films. Max's Deli and a Japanese restaurant. Peet's Coffeehouse with an adjacent bookstore, and a salon are located on the Plaza level. A three block walk up Van Ness will bring you to a AMC Movie Theater showing current films. Tommy's Joint, an early San Francisco Hofbrau/Pub is also a three blocks walk. (Good for take out). Whole Foods Market is four blocks up Franklin St. We are three blocks from the Opera House, one block from City Hall, three blocks from the San Francisco Public Library. The San Francisco Symphony (Davis Hall) and the San Francisco Jazz Center are a three block walk. Hayes Street, a trendy walking street. is a short distance and provides, exceptional restaurants and shopping. Whole Foods market for groceries, is a short distance away. Public transportation is available on Van Ness Ave which includes city buses, historic trolleys and our subway BART. We provide a well located car parking place within the building for our guests. The San Francisco Opera rents our apartment in season. We often have returning artists who appreciate the convenience and the comfort of our location.